Blogging is good when done right, but far too often, it is done wrong. Many writers think that they can create a short blog post that targets a keyword, and that Google will consider it a good page of content. Not likely. But don’t be fooled into thinking long form posts will work either. They won’t unless the content is of the highest quality and is well structured and informative. There was once a time when mass-produced city pages were actually good for SEO. Those times are gone. Although Google’s crack down on these pages is relatively recent, it aligns appropriately with their philosophical mantra. How can a bunch of trashy city pages enhance user experience? Answer: They Can’t. It’s been a long time coming for Google to drop the hammer, and we’re glad they did. You should still use location pages, but they must be unique. Forget city pages for a moment because right now we’d like to talk about city stuffing. This refers to a homepage that tries to optimize for two or more cities. Guess what, Google’s not buying it. They want separate location pages (good ones) with subfolders for each city. The homepage should go for one city only, and if you are in a densely populated city, you need a new strategy. If we are going to pinpoint the death of competent SEO, we can probably trace it directly to the advent of content spinning software. These “spinners” take content that was written and flip the words around to prevent duplicate content (or try to). The problem is that the language produced is not English, Spanish, or French, it’s gibberish. Worse yet, the content is still looked at as duplicate because Google is simply not that dumb. Some SEO’s create additional websites as a doorway to the main site. This ends up hurting everything instead of helping anything. Usually they use a cheap template site for the doorways, and try to go for keywords that the main site doesn’t currently rank for. Again, Google is not buying what you’re selling, and the result is not something you want to explore. Sometimes marketers will buy expiring domains in hopes of retrieving the regular traffic and reappropriating it as a different service or concept. Google knows you’re doing this, and not only that, but the users expecting the old site will be disgusted by what they see. They will exit immediately, increasing your bounce rate, and further convincing Google that your website is worthless. But what about similar sites? Hey, that’s more of a grey area, but we wouldn’t recommend it. Someone at your last service thought white text would hide keywords from the user, but still force the search engine to index them. Oh they index them alright, right into their manual penalty section. The attempted manipulation is so egregious, and the disrespect of the perpetrator is shamelessly arrogant. To think Google is that stupid is an abomination of search engine optimization. It’s pretty simple, shoving keywords everywhere possible within your content will not only discourage Google from ranking the page, but possibly inspire them to slam you with a manual penalty. Good luck digging yourself out of that hole once it’s imposed. There’s no plea of ignorance that will suffice for something so blatant and contradictory to a positive user experience. Are you a farmer? Thought so. Since you aren’t, you shouldn’t be farming links to your domain or from it. These spam links are pure trash and Google has already destroyed the livelihoods of those who utilized them back in 2012. Have they let up a little bit in recent years? Quite possibly. But don’t think you’re getting one over on Google. They might not penalize websites for links, but they will ignore them altogether, meaning there’s no benefit to trying. Some bright-mind at your last firm might’ve tried a negative SEO attack on one of your competitors. They sent spam links from sketchy sources to your competitors domain. They might’ve even used anchor text like “this website is garbage” or something similar. It’s funny that any marketer could think Google would be gullible enough to penalize an innocent website for links. We all love Wix and Weebly, but don’t expect to rank well with their websites. Why? They are template based sites and they tend to only succeed when associated with big brands that have an official website. The code structure on these sites is identical to hundred of thousands of others across the web, and inspire zero uniqueness. Sure, it’s a major financial incentive to choose a free site maker, but the ROI just isn’t there. Speaking of templates, Wix and Weebly are not the only platforms that utilize them. Even WordPress, which is the Content Management System we use to design custom sites, partakes in the usage of for-sale web templates. Since WordPress is open source, anyone can make a theme based on the infrastructure, and sell it privately under their own name. That’s why most of the websites we see from prospective clients are using $60 WordPress templates, and fail to rank for any good keywords. There’s some review software out there that will redirect the reviewer to a survey if they leave a review of less than 3 stars (or whatever number the programmer decides). The idea of this is to prevent bad reviews from ever reaching Google or Facebook. Google cracked down on this tactic and will now penalize websites and Google My Business profiles utilizing it. So don’t be one of them. Do you have a website about business supplies and some hot shot marketer thought they could get more traffic by redirecting users from casino sites? In cases like these, the marketer will create pages for gambling and redirect the users to your business supplies websites. It’s an archaic strategy that has not worked since the Bush administration, and didn’t work well then. 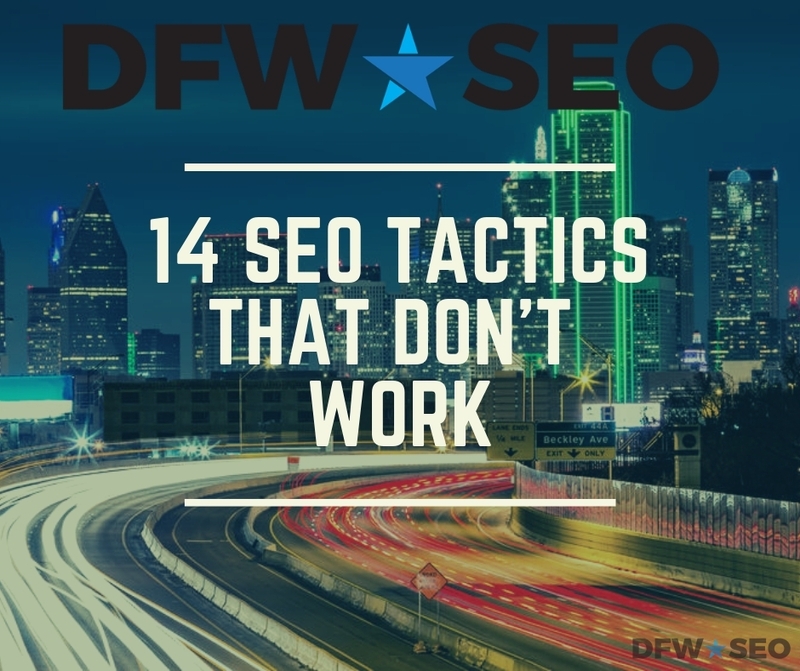 14 is only a small percentage of the SEO tactics that don’t work. We know of many more. If you don’t think you want a full time SEO agency handling your marketing campaign, maybe consulting would be a better avenue for you. As a top Dallas SEO consultant, we can guide you through the constantly evolving space that is Google search. It’s necessary to have someone looking out for the latest trends and algorithms imposed by the mothership that is Google. We will be working on your behalf, and always be looking out for your best interests. We can help navigate small businesses in the Dallas – Fort Worth, Texas area through murky SEO waters. There’s several areas of expertise that we can focus on. Whether you’d like to know more about why you website is not optimally designed, or why your title tags don’t translate to page one rankings, we can offer advice. Furthermore, we can talk about more cutting edge aspects of SEO like company branding, digital assets analysis, and Facebook pixel tracking. We have clients throughout the DFW Metroplex, and are happy to have you come on board as well. Since we know the local area so well, we might have insights that cannot be replicated with a “national” marketing firm. We hope to hear from you. Just call 800.231.4871 right now!